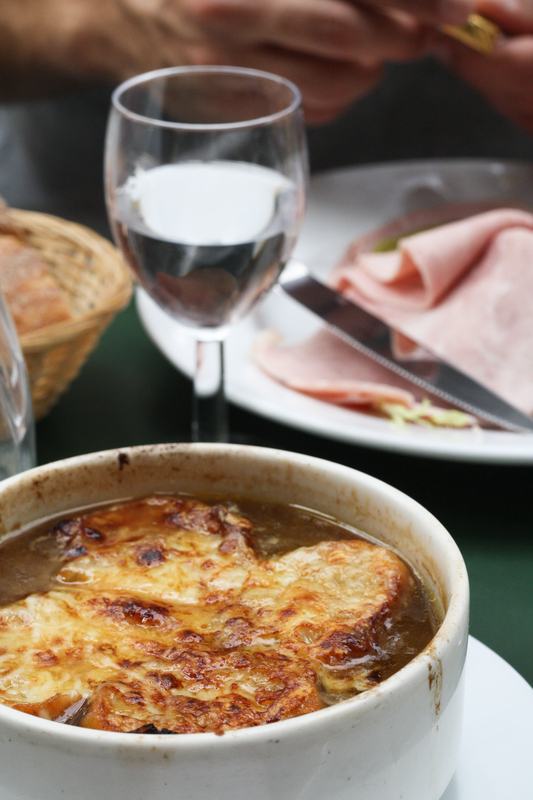 French Onion Soup and Duck Parts @ Les Philosophes, Paris. “It is just onion soup if you’re in France.” M declared, as he watched me edit and label the photos on the interwebz. Il a raison. It wasn’t French onion soup, the French was unnecessary. Yet I included it anyway, because it seemed incomplete without calling it French. An what-would-be-ordinary onion soup made better because of that pile of crusted bread with melted cheese floating on top. The cheese just whimpered and dissolved into a pile of delicious mess under the scorch from the boiler, bubbling and browning. Caramelized onion shreds were non-existent by this point, forming thin jello-like substance inside the beef broth, a deep golden-brown. This was the first part into my two-part meal at Les Philosophes in the Marais, the latest and trendiest district of Paris. 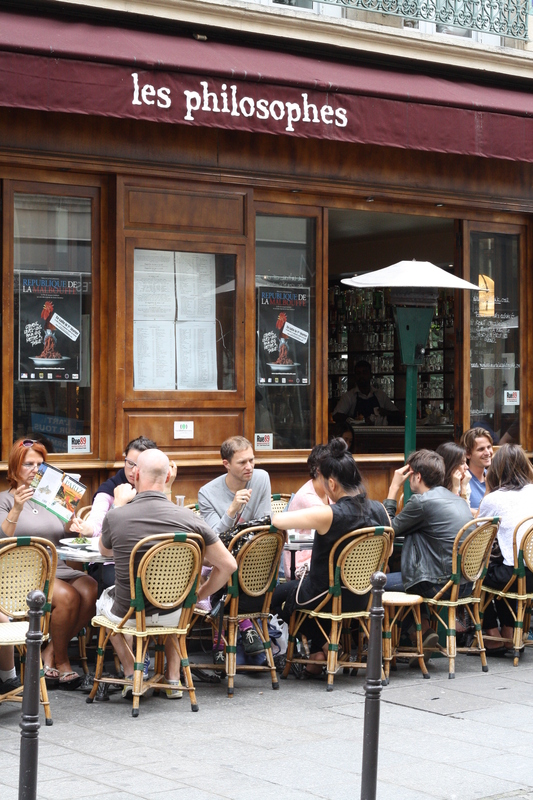 The cafe was hidden between narrow streets lined with boutiques and other cafes. Situating ourselves at the outdoor seating, we had the luxury of watching a mixture of classily dressed office ladies strutting off in their 3-inch heels, business men in suits on their uncharacteristically bright (only to me, it seemed) scooters, as well as dark-haired art students holding their canvases in outfits likely made by themselves. 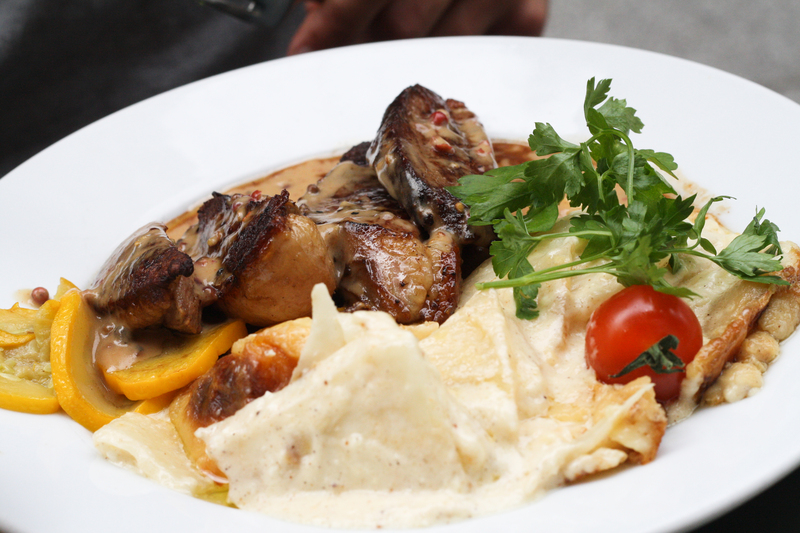 A lunch menu was typical in French restaurants and cafes: 25 Euros for an entree and a main course, more to include dessert. Entree in France is an appetizer, which makes sense (the ‘entering’ plate). I wonder where it turned into main course in the United States. I didn’t capture M’s entree, but snuck a picture of his main course of the day’s duck breast special with gratin dauphinois. The duck breast was slightly overcooked, to shame, while the potatoes were undercooked. It was lovely nonetheless, but we couldn’t help but have much heightened expectation in Paris. My main course, on the other hand, was out of this world. 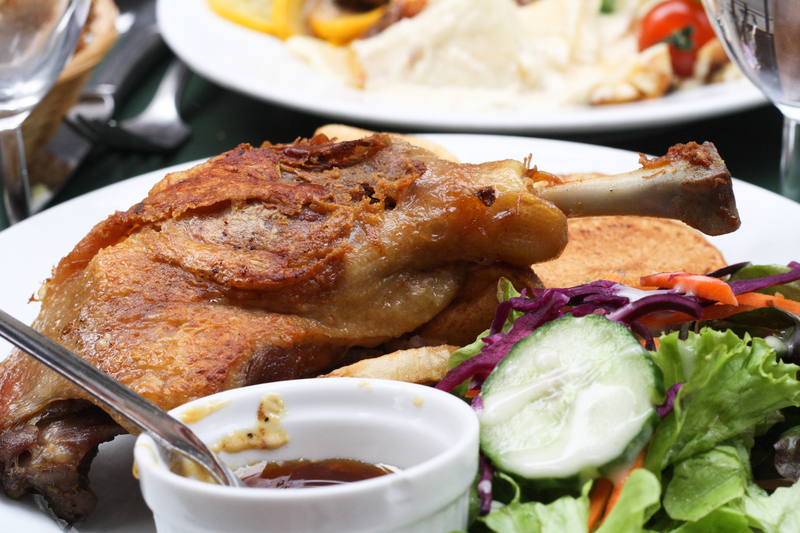 A scrumptious piece of duck leg laid in my plate, crisp and golden. It came with a tiny ramekin of honey; poured on top of the leg and the golden liquid oozed slowly into the crevasses of the fried skin, giving the leg added sweetness and an almost nutty flavor. The skin crumbled like fall leaves at my bite, while the dark meat revealed itself in the most flavorful form, tender and juicy like harvest. It blew my tongue’s mind. Even the salad and the fried potato slices were delicious. Simple, without many bells and whistles. But simple done well. I sucked the bones through of that duck leg, not exactly a very classy thing to do, especially in Paris. M watched me as I chowed down like a mountain lion, and could do nothing but sigh a very French sigh. But I simply didn’t care.